Something occurred to me yesterday, but my camera needed charging so I had to document it with my phone. You'd think it was Christmastime, wouldn't you - a blue Christmas! har har. But no. Kind of the opposite, and not just seasonally, but more on that in a moment. 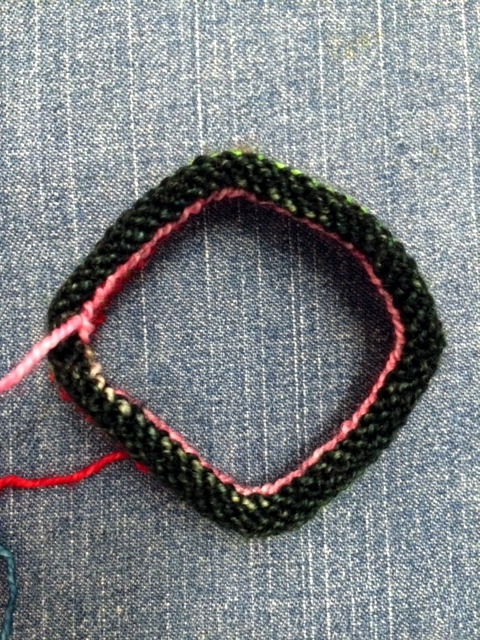 First I'd like to point out the sneaky pink cast on edge for my fingerless mitts. 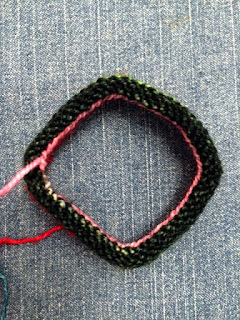 I didn't really want a pale pink stripe in this mitts, even though I do love pale pink, but using the end of this stripe for the cast on allowed me to make full use of the dark green section of my self-striping sock yarn. 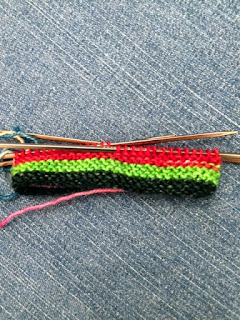 And while I'm on the subject, even though the big advantage of self-striping sock yarn is that you don't have to manually change colours, you can still do it. 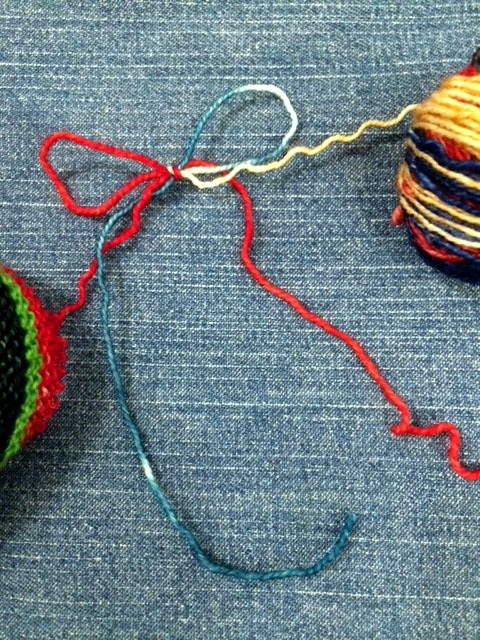 Too many reds too close together, I thought, so I tied a bow which I will loosen later to run the ends in properly. 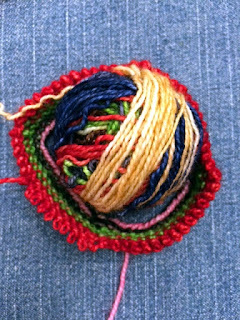 For now, a nice neat bow allows me to keep the colours sorted out and rolled into a ball to knit from. Ugh, what can I say? I was just about to finish off the top of the mitt when I noticed I had 15 stitches on one needle and 14 on all the others, and I traced the trouble all the way back to the cuff, and I couldn't make myself not rip out to fix it. I must really not want to knit Carolyn and Wayson's socks. 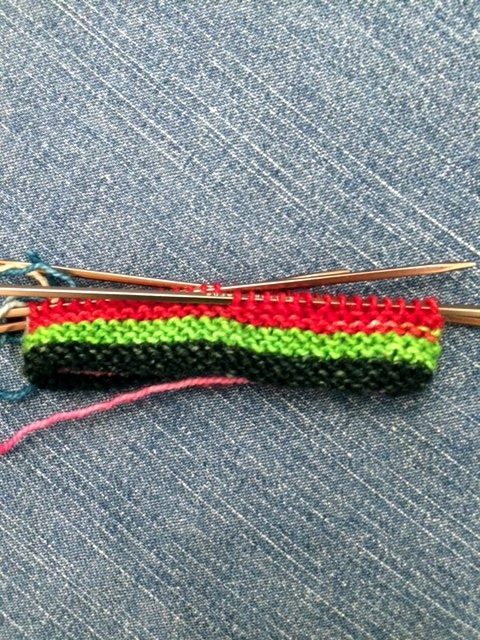 Either that or I should really be knitting them self-striping socks so the lure would be stronger. Anyway while I was at it, I shifted the colours a bit. I had a dark blue beside a dark brown, followed by a bright green and I think a bright red? 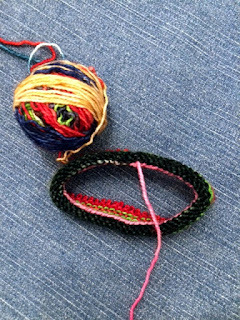 I absolutely love that in the socks I knit with the bulk of this yarn, but I'd rather alternate the dark and bright colours for the mitts. Sometimes I swear I'm my own worst enemy. If you're an inconveniently perfectionist knitter too, what's the worst thing you've let yourself do with a project?